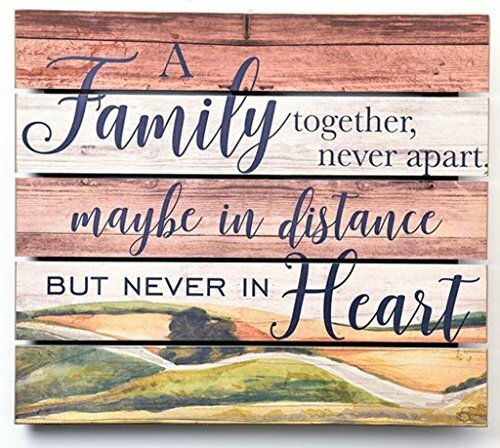 Light Brown Distressed Wood Design Wall Sign with brown plank design accents, green hills and black house design background. The sign has "A FAMILY TOGETHER, NEVER APART, MAYBE IN DISTANCE BUT NEVER IN HEART" written on it in elegant black typography. The measurement of the sign is 14" x 16" x 3/8". The sign is made out of wood and can easily be hang up on a wall. The measurement of the sign is 14" x 16" x 3/8"